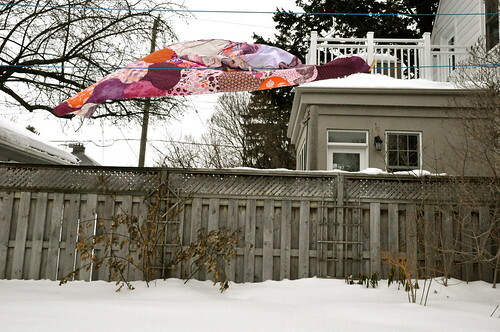 It's fantastic and I love the pics of it blowing in the wind. 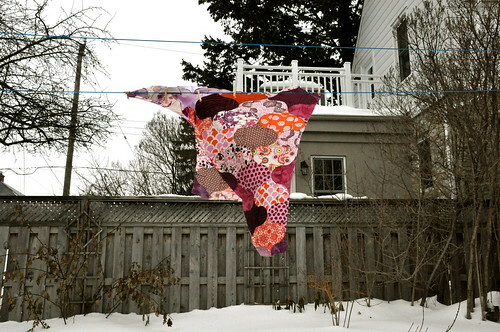 Looks chilly there! just saw it in my flickr group and i ADORE it! even more so now that i read about the making of the quilt. good job; this sounds like it took a lot of patience. 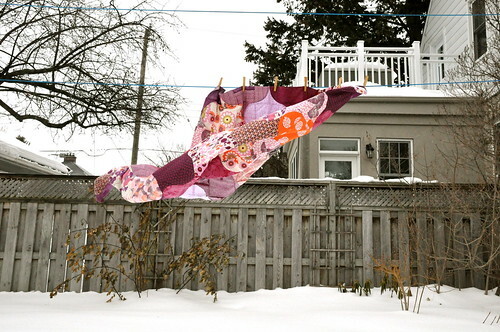 Such great photos of your quilt in the middle of winter! 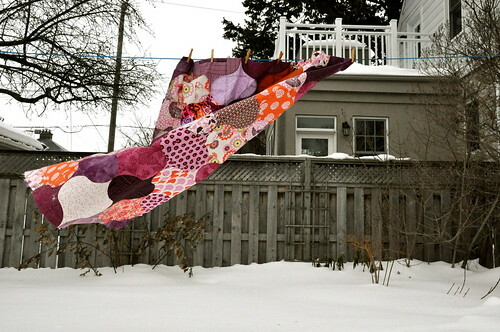 Your quilt is especially stunning photographed on a gray day against the wonderful many gray shades of city dwelling. The colors are so much more deliciously cool looking. And I love the mistakes. So good for the psychie. Keeps things in perspective so to speak. Creativity, is undimmed by error. In fact, solving the problems that you may refer to as errors, is actually a wonderful example of creativity itself. Thanks for the fresh breath of inspriration. Looks great Lesly. 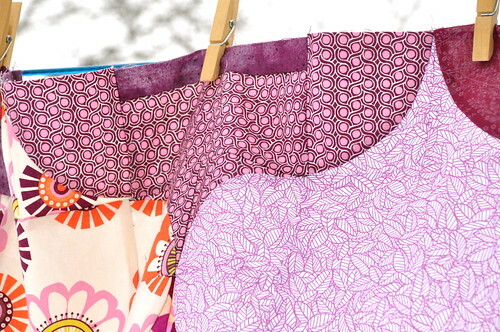 I can't imagine any of these "flaws" will be at all noticeable once you get it quilted up. It is great! I do like your that your "flaw" can become a fashion statement! 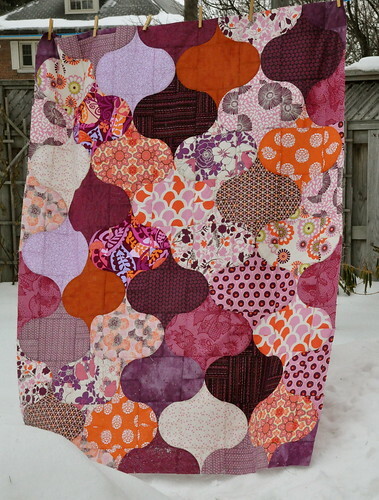 In honour of "ogee," that should TOTALLY be the lab quilt. It's a SIGN! That quilt is beautiful, Lesly! You did a great job with all those curved seams!! It's pretty agains the snow, too! Oh gee, ain't it pretty! And actually I never noticed those little pieces you had to add in, and had to really search for them in the whole quilt pics. they blend right in! Also your colours are stunning! 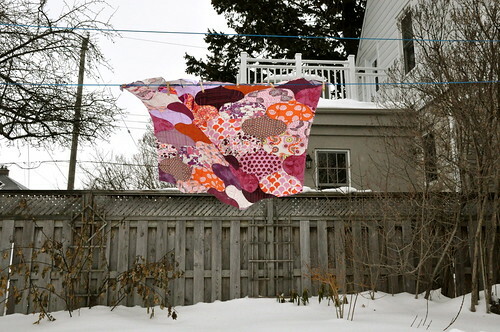 I personally think grey days are better for reproducing the "real" colour of a quilt. But that's just me... So lovely, Leslie! Happy Valentine's Day, btw! 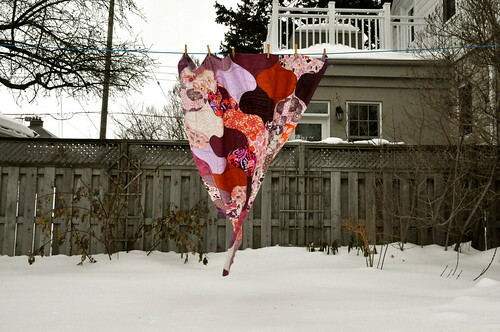 the quilt is stunning Lesly. I wouldn't worry about those small things. As I told a new quilter if it was absolutely perfect then it would have come out of a factory and not made with love and attention. Ogee! You've done a great job, Lesly. 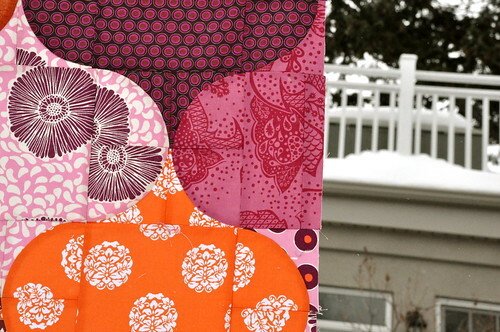 It can be a machine quilting shape and struck me as an odd name. But a good design shape and your colours are wonderful. I love it!! Hurry and quilt it... I can't wait to see it finished! 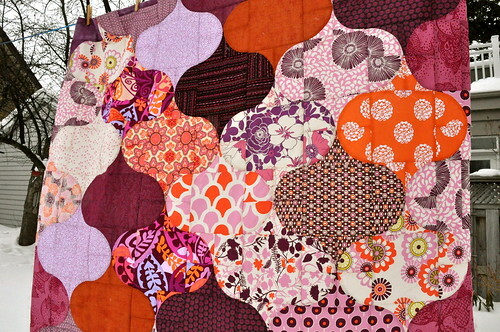 Love this quilt colors - beautifully done! Glenda (who commented on Feb 13) - I wish there was a LIKE button for your comment! Beautiful! 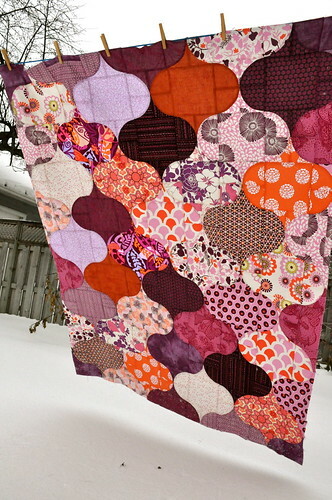 Can't wait to see it quilted. very lovely. Curves still really scare me! Just found your blog today and am now following! Don't think of them as imperfections, they are design features! I really like this. Please put me on your email list....love your curves...great job!! !